WASHINGTON, DC, September 16, 2011 (ENS) – A U.S. investigation board blames the worst offshore oil spill in the nation’s history on British oil giant BP and also points to BP contractors for contributing to the Gulf of Mexico disaster. The loss of 11 lives at BP’s Macondo oil well in the Gulf of Mexico on April 20, 2010, and devastating pollution of the gulf were the result of “poor risk management, last-minute changes to plans, failure to observe and respond to critical indicators, inadequate well control response, and insufficient emergency bridge response training,” finds the board’s final report. The final investigative report of the Joint Investigation Team of the U.S. Coast Guard and the Bureau of Ocean Energy Management, Regulation and Enforcement, BOEMRE, was released Wednesday. It concludes that four companies were responsible for the April 20 blowout that killed 11 crewmembers and spilled five million barrels of oil into the gulf over the next 87 days. The JIT panel determined that BP, as the designated operator under BOEMRE regulations, was “ultimately responsible” for conducting operations at Macondo in a way that ensured the safety and protection of personnel, equipment, natural resources, and the environment. Transocean, the owner of the Deepwater Horizon, which BP leased to explore the Macondo well, was responsible for conducting safe operations and for protecting personnel onboard, the panel found. Halliburton, as a contractor to BP, was responsible for conducting the cement job, and, through its subsidiary, Sperry Sun, had certain responsibilities for monitoring the well, the report states. Cameron was responsible for the design of the Deepwater Horizon blowout preventer stack, a five-story high set of valves that was supposed to prevent blowouts such as the one that resulted in the loss of the rig, which today lies on the sea floor a mile below the surface, about 40 miles southeast of the Louisiana coast. At the time of the blowout, the rig crew was engaged in “temporary abandonment” activities to secure the well after drilling was completed and before the Deepwater Horizon left the site. The panel found that “a central cause of the blowout” was failure of a cement barrier in the production casing string, a high-strength steel pipe set in a well to ensure well integrity and to allow future production. “The failure of the cement barrier allowed hydrocarbons to flow up the wellbore, through the riser and onto the rig, resulting in the blowout. The precise reasons for the failure of the production casing cement job are not known,” the report states. First, BP did not set any additional cement or mechanical barriers in the well, even though various well conditions created difficulties for the production casing cement job. Then, BP decided to set production casing in a location in the well that created additional risk of hydrocarbon influx. BP’s decision to include the setting of a lock-down sleeve – a piece of equipment that connects and holds the production casing to the wellhead during production – as part of the temporary abandonment procedure at Macondo increased the risks associated with subsequent operations, including the displacement of mud, the negative test sequence and the setting of the surface plug, the report finds. 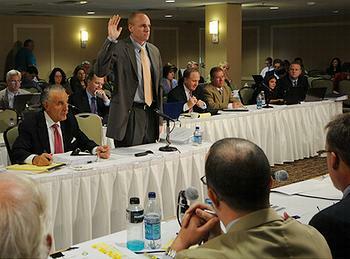 The panel concluded that BP failed to communicate these decisions and the increasing operational risks to Transocean. As a result, BP and Transocean personnel onboard the Deepwater Horizon on the evening of April 20, 2010, “did not fully identify and evaluate the risks inherent in the operations that were being conducted at Macondo,” the report states. The rig crew conducted an initial negative test on the production casing cement job that showed a pressure differential between the drill pipe and the kill line, which is a high-pressure pipe leading from the blowout preventer to the rig pumps. “This was a serious anomaly that should have alerted the rig crew to potential problems with the cement barrier or with the negative test,” the report states. But, “At this point, the rig crew most likely concluded that the production casing cement barrier was sound,” the panel said. “The cement in the shoe track barrier, however, had in fact failed.” Oil and gas began to flow from the Macondo reservoir into the well. “Despite a number of additional anomalies that should have signaled the existence of a kick or well flow, the crew failed to detect that the well was flowing until 9:42 pm. By then it was too late – the well was blowing drilling mud up into the derrick and onto the rig floor,” the report states. “If members of the rig crew had detected the hydrocarbon influx earlier, they might have been able to take appropriate actions to control the well,” states the report. In the past, this rig crew had experienced problems in promptly detecting kicks, the panel determined. 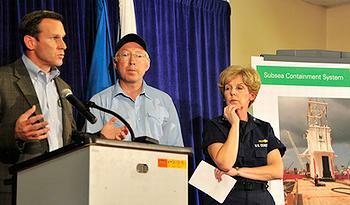 “The Deepwater Horizon crew had experienced a kick on March 8, 2010 that went undetected for approximately 30 minutes. BP did not conduct an investigation into the reasons for the delayed detection of the kick. Transocean personnel admitted to BP that individuals associated with the March 8 kick had screwed up by not catching the kick. Ten of the 11 individuals on duty on March 8, who had well control responsibilities, were also on duty on April 20,” the report states. The panel found evidence that BP and, in some instances, its contractors, violated seven regulations of the Minerals Management Service, the division of the Department of the Interior then responsible for governing oil and gas development. 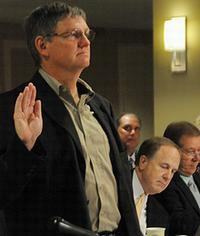 After the Deepwater Horizon disaster, the Minerals Management Service was replaced by BOEMRE. Although the panel found no evidence that MMS regulations in effect on April 20, 2010 were a cause of the blowout, the panel concluded that “stronger and more comprehensive federal regulations” on cementing procedures and testing, blowout preventer configuration and testing and well integrity testing might have reduced the likelihood of the Macondo blowout. BOEMRE now has implemented many of these improvements. The JIT report concludes with the panel’s recommendations to improve the safety of offshore drilling operations, among them improved well design for wells with high flow potential, better well integrity test practices, the use of more accurate kick detection devices and better training for rig crews. 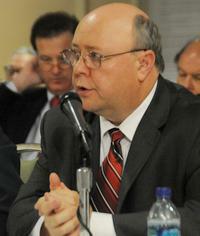 The Joint Investigation Team was formed on April 27, 2010, by an order of the Departments of the Interior and Homeland Security to investigate the causes of the Deepwater Horizon explosion, loss of life, and resulting oil spill, and to make recommendations for safe operations of future oil and gas activities on the U.S. 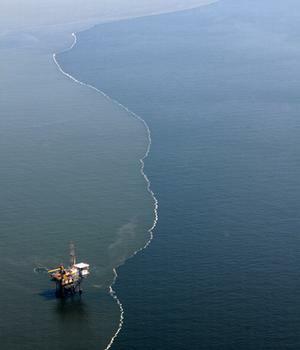 Outer Continental Shelf. The report’s conclusions are based on seven sessions of public hearings, testimony from more than 80 witnesses and experts, and information from a large number of documents and exhibits. Critics say the government also must hold itself accountable for inadequacies that led to the tragedy. “While the report asserts that it found ‘no evidence that MMS regulations in effect on April 20, 2010 were a cause of the blowout,’ it goes on to acknowledge that ‘MMS regulations in place at the time of the blowout could be enhanced in a number of areas,'” she said. In January, the World Resources Institute, a Washington-based think-tank, produced a study highlighting key reoccurring governance failures that contributed to the spill. It highlights weak regulatory systems and the need to address the “institutional culture of managerial irresponsibility and lack of accountability” within the U.S. Department of Interior. 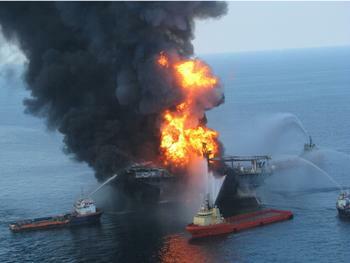 BP and Halliburton are locked in a legal fight over responsibility for the disaster. Most recently, Halliburton filed “negligent misrepresentation” and defamation claims against BP in Texas state court on September 1 and extended its existing action in Louisiana to include fraud. “Halliburton has learned that BP provided Halliburton inaccurate information about the actual location of hydrocarbon zones in the Macondo well. The actual location of the hydrocarbon zones is critical information required prior to performing cementing services and is necessary to achieve desired cement placement,” the company said. The consequences of the blowout and oil spill have resulted in an avalanche of litigation – 657 individual cases to date with allegations ranging from personal injury and property damage claims to violations of securities law. To view a database of all legal actions click here.